Ministry of Propaganda - 13/Oct/2004: "Horse and Chicken Content"
Somehow I doubt I'll set a new trend here, but then again, you never know. Anyway, so far we've had Moose content and Cat content going through blogland. I've had Rabbit content, Fox content and even Cat content. I'm sure there's Dog content out there somewhere as well. 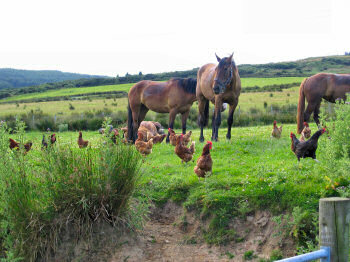 Whatever, I thought it's time for something new and proudly present: Horse and Chicken Content. No idea if I'm the first with it, neither do I know if I'll be that last. But this blog now has horse and chicken content. Does yours? Before I forget: picture courtesy of my sister Imke during her summer holiday. When writing this entry the weather was: mostly cloudy I think. Cold.